CONVERTIBLE TOP REPLACEMENT MADE SIMPLE! Model, year and window selection are easy. Fabric selection is determined by your preferences and budget. 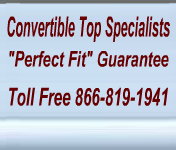 When you are looking at your particular vehicle we have usually identified what is the original fabric for your vehicle. If this information is missing and you want to know please contact us. Quite often our customers are upgrading from the original fabric to a better quality top. An example of this would be a Miata top that was originally a Cabriolet vinyl and now a canvas top is preferred. You are not limited by the original fabric – any fabric grade listed for your top may be ordered. NOTE: Window options are interchangeable. Heated Glass window (defroster) – you can order vinyl window, tinted glass window or heated (defroster) glass window. The defroster will only work with the heated glass window. Cables are thin strands of stranded wire or plastic and are components of 90% of the convertible tops on the road. Early foreign vehicles in some cases did not have cables at all. Cables run from the front to the back of the top along the window edges and they are what keep the top straight and tight. Over time these cables become weakened with use and stress. It is always recommended that the cables be changed with the new top. If you decide to reuse your cables and they break it will require that the entire top be removed, new cables threaded through and the top reinstalled with the new cables. They are perhaps the least expensive component but one of the most critical. Pads are on some convertible tops and not others. Some foreign vehicles do not have pads while most American cars do. SUVs such as the Tracker, Sidekick, Sportage do not have pads. Generally, pads are long, thin strips of fabric with a foam padding inside. The pads run from the front to the back of the convertible top along the edges. They protect the bows on the frame from rubbing against the convertible top fabric. They are a buffer to keep the convertible top fabric from wearing out prematurely. Pads are generally reusable. But if your convertible has been damaged and the pads have been cut, punctured, or removed your installer should be able to reuse them. Sun and extreme elements can also require that they be changed. If you have a headliner in your vehicle then the pads and the underside of the convertible top will be hidden and it doesn’t matter if you order the least expensive pads like the Pinpoint pads. The headliner is the fabric that you see when you are seated in your vehicle and look up at the roof. It is a piece of fabric that is attached so that the underside of the convertible top and the bows are not exposed. If you do not have a headliner you will see the underside of the frame, bows, and the underside of the convertible top fabric. In this case you should order the pads in a matching fabric to the convertible top fabric so that the pads would blend in with the underside fabric color.